I also do some restoration and repair of old decoys. 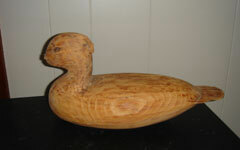 I have experience in many different decoy styles and makers. However, I am a full time carver and not a full time repairman. I will need to see the decoy or at the very least view some good pictures of your bird before I can tell you if I am willing to work on it. An estimate of the work is then to be done. I always reserve the right to refuse to do the work. I also can't estimate a price until I actually see the decoy. However, I am always up to a challenge, so do not hesitate to email me about work needed to be done on your fine decoy. Thanks.